It's been way too long since a nerd out on numbers post, so let's dive into some digits. 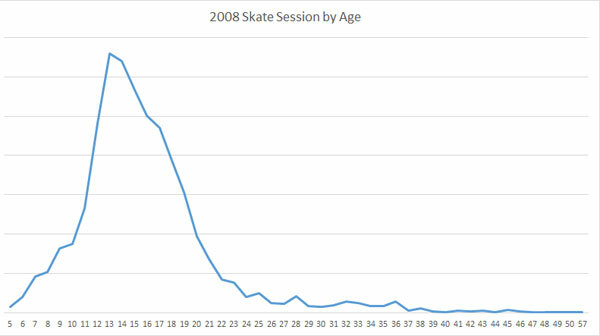 I was interested in how the ages of skaters has looked over the years. What would you guess? Are skaters generally younger these days than ten years ago or are they older or both? Let's take a look starting with 2004. Back then, kids aged 13 and 14 made up the top two ages for total skate sessions. 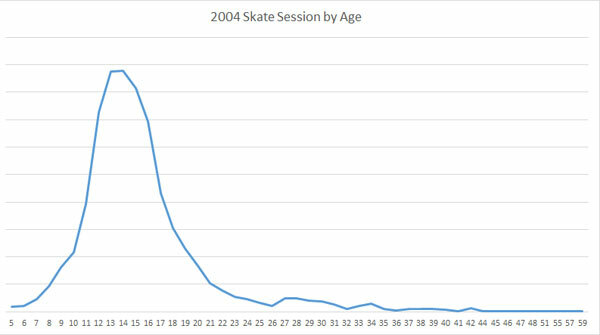 This chart shows total skate sessions by age. As you can see, it starts to drop off pretty sharply after 15. In 2008, ages 13 and 14 were still the top ages for skate sessions. The distribution isn't too different here, but you can start to see that there are clearly more skaters in the upper teen range. Jumping forward to 2012 is where you can really see a change. 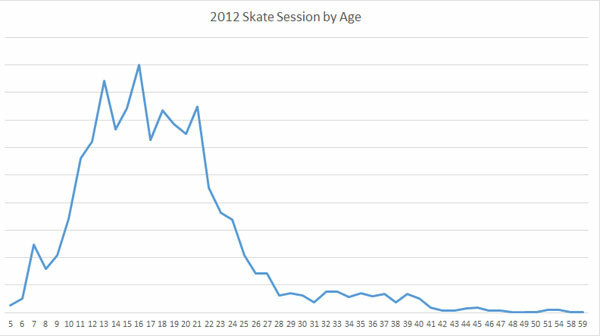 The top three ages for total skate sessions are 16, 13, and 21. Wow, older kids are skating or younger kids that started skating have really stuck with it. Either way, great to see. 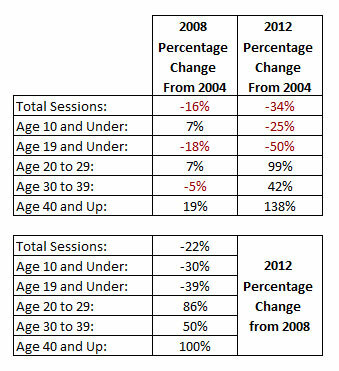 The chart clearly shows the drop off in sessions for each age occurs in the early 20's rather than mid-teens. Is skateboarding becoming more "sticky" where it stays with you as your lifestyle? Hold on before that judgement. We've got more numbers to check. I don't want to give out specific totals and numbers as far as total sessions, but percentage changes I can discuss. The first thing we're looking at here in this table is the 2008 and 2012 percentage changes in total skate sessions as compared to 2004. 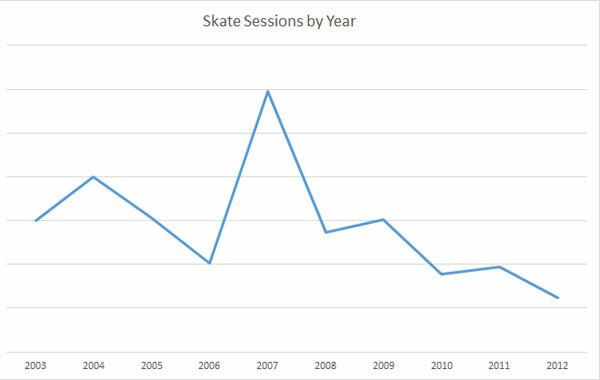 Damn, there's been a 34% drop in skate sessions from 2004 to 2012. What happened? All the free concrete parks opening up around here? Less skateboarders overall? Who knows, but look below that and you can see how these numbers changed in various age categories. The number of 10 and under kids skating dropped 25% since 2004. Wow, I would have expected an increase. Why are there less really young skaters coming through our doors? And the next number is even more alarming. A 50% decrease in skaters 19 and under. Wow. Moving on to the older categories, it's amazing to see the number of skaters in their 20's double since 2004 and skaters 40 and up more than double since then. People are definitely skating for life these days and that I cannot be more happy about. So I pulled out three years in the above charts to compare, which naturally makes you ask the question of how skate sessions year by year have looked. Once again, I can't give you the total numbers themselves, but I can show you the line graph representing the change. I hope the downward trend is just us and not skateboarding overall. I'd like to think it's all the parks opening up around here being built by local cities. Don't worry about us business-wise, though. We are very diversified with everything we do here, especially with all these events we put on. Plus, when there's more skateboarders in the area, our retail benefits of course, although we have felt the dent from the big chain skate shops I think. Thanks for checking out my nerdy numbers analysis. I'm going to try to do more of these on all kinds of other categories and topics I record data about. Signing off in the words of Jim Thiebaud, "thank you skateboarding."